Jason A. Crotty is a birder and lawyer living in Portland, Oregon. Jason’s first contribution to 10,000 Birds tackled the importance of the National Wildlife Refuge System. How many birders are there in America? As it turns out, there are very few estimates. Indeed, there appears to be just one. In 2013, the U.S. Fish & Wildlife Service released “Birding in the United States: A Demographic and Economic Analysis.” That study (which used data from 2011) claimed that there were 47 million “birders,” of which 41 million were stay-at-home “backyard birders” and 18 million were more active “away-from-home” birders who traveled at least a mile to see birds. Based on these numbers, FWS estimated that birder spending on equipment and travel generated nearly $107 billion in total industry output, 666,000 jobs, and $13 billion in tax revenue. That’s a lot of birding. 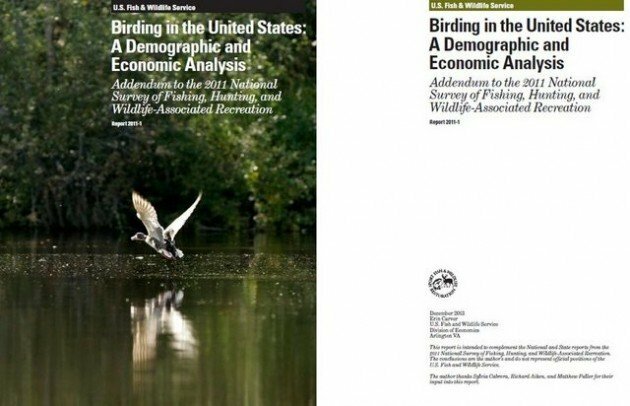 The report even stated that it was using a “conservative definition” of “birder,” suggesting that there were perhaps more than 47 million birders generating even greater economic impact. There were similar FWS studies using similar methodologies with similar findings in 2007 and 2003. However, I suspect that both FWS figures—47 million birders and 18 million active birders—overstate the number of “birders” as that term would be understood by those in the birding community. Put another way, I believe that most of the 18 million “active birders” would be quite surprised and a bit perplexed to find themselves so categorized. Some birders might exclude from the flock those who do not at least have a pair of binoculars and a field guide, the ability to identify common local birds, or those who have not traveled to go birding. Others might require a life list or the ability to identify a specific number of species, or some other criteria. And birders would expect other birders to understand the specialized language of birding and share other characteristics of the community. This is not to suggest that one must bounce about the Pacific Ocean on a pelagic tour with Debi Shearwater to qualify as a birder. But driving a mile to walk at the local park and seeing ducks on the pond does not a birder make. While we cannot realistically conduct another survey with different questions or construct different categories with the FWS data, we can assess its conclusions with other data. Individually, all of the indirect measures that follow are imperfect, but collectively they provide some insight. Organizations: There is a group dedicated to birding, the American Birding Association. Right now, it is in the midst of an ambitious recruiting drive, to expand its membership from about 12,000 to 16,000. (These figures are from Jeff Gordon’s introduction in the February 2016 issue of Birding.) Of course, there are many birders who are not members of the ABA, but 12,000 is a modest number. If 1 in 100 birders was a member of the ABA, that would pencil out to 1.2 million birders. If 1 in 1,000 was a member, that would result in 12 million birders, still far below the FWS figure of 18 million active birders. Magazines: There are several magazines dedicated to birding. 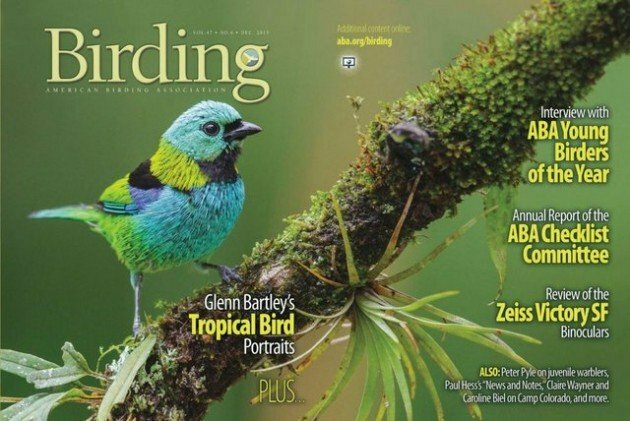 Receiving Birding magazine is a benefit of being an ABA member, so its circulation numbers are the same as ABA membership. There is also Birdwatching (approximately 30,000 subscribers—an estimate from a third party) and Bird Watcher’s Digest (approximately 35,000 subscribers). Again, not all birders subscribe to birding magazines, but these are also modest numbers. eBird: Although many birders do not use eBird, it is quite popular and many young birders are eBirders. There are (as of 2015) approximately 262,000 world-wide users of eBird. Of course, many eBirders live outside the U.S., so the American contribution to eBird is lower. This too is a very modest number compared to 18 million active birders. 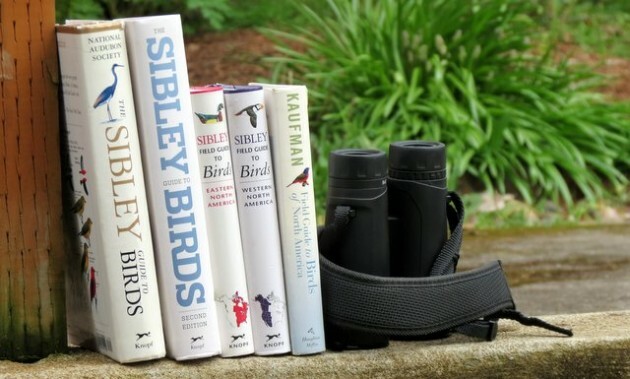 However, at least one source reported that in 2002, there were approximately 700,000 copies in print of the Sibley Guide to Birds and 250,000 of Kenn Kaufman’s Field Guide to Birds of North America. Of course, there are a number of other field guides, but these are two large players. These numbers are substantially higher than ABA membership or magazine subscribers, suggesting a higher number of birders. But if we guesstimate (generously, I think) that there are approximately 9 million field guides in print, that figure would be just 50% of the FWS figure for active birders. And that back-of-the-envelope analysis would not account for institutional purchases or the fact that many birders have several field guides. Facebook: Another possibility is to look at “likes” for birding-related organizations on Facebook. “Liking” an organization or individual on Facebook is essentially costless and signifies some level of interest in the “liked” subject. Because Facebook is now ubiquitous, this data should include many birders, even if the demographics of birding are a bit older. Once again, not all birders are on Facebook and not all birders on Facebook will “like” birding-related organizations. Some examples: David Sibley (about 158,000 “likes”), eBird (about 47,500), Rockjumper Worldwide Birding Tours (about 30,000), Zeiss Birding (about 18,500), 10,000 Birds (about 17,000), American Birding Association (about 15,000), Kaufman Field Guides (about 11,300), ABA Rare Bird Alert (about 11,000), Field Guides Birding Tours (about 6,400), Biggest Week in American Birding (about 6,100), Rio Grande Valley Birding Festival (about 5,500), Space Coast Birding and Wildlife Festival (about 3,700), Victor Emanuel Nature Tours (about 2,200); Shearwater Journeys (about 2,200). There are more, but these seem representative. More broadly, for bird-related conservation and study, there are: National Audubon Society (about 740,000), Cornell Lab of Ornithology (about 680,000), American Bird Conservancy (about 580,000), BirdLife International (about 250,000), National Wildlife Refuge System (about 225,000), Bosque del Apache NWR (about 58,000). These Facebook “likes” (note that these numbers are global “likes”) further suggests that the number of active birders is significantly lower than the FWS estimates. 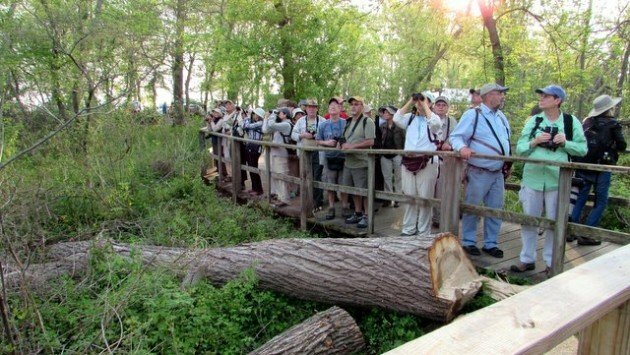 Others: There are many birding festivals, including several large and well-attended ones, but attendance numbers for any individual event do not provide much information about the overall number of birders. There are companies that track traffic on websites, and they are interesting, but seem duplicative of other data. Nonetheless, here are links to a few: ABA, eBird, 10,000 Birds. As an example, the ABA website appears to average somewhere in the neighborhood of 175,000 to 275,000 visits per month. One could also count followers on Twitter, but those numbers also seem duplicative of other online numbers. Here are a few: ABA (about 6,000 followers), eBird (about 10,000), 10,000 Birds (about 2,000). These numbers are also fairly modest. Again, all of these indirect measures are imperfect. But they have the advantage of being countable and clearly directed to the birding community. With this data, we can broadly evaluate the FWS conclusion that there are 18 million active birders. If you think that birders tend to enjoy birding independently and are strongly disinclined to join birding organizations, subscribe to birding magazines, buy field guides, or engage in any manner with the birding community online, you might think these numbers support the FWS conclusions. But if you believe, as I do, that a meaningful percentage of birders are likely to engage in at least some of these activities, you probably believe that the FWS numbers are too high, and perhaps way too high. The data suggests to me that there are perhaps a couple million “birders”—people who would not be surprised to be classified as birders. But that estimate is admittedly more art than science, depending, as it does, on one’s estimate of what fraction of birders would engage in these countable activities. The point is not that birders are a tiny or insignificant group, but rather that FWS is too broad in its definition of “birder” and/or that the survey questions are not nuanced enough to distinguish birders from non-birders. The demographics of birders (older, wealthier, and more educated than the overall population) and their widespread distribution and passionate commitment means birders are likely desirable consumers (particularly for optics manufacturers and birding tour companies) and a potentially significant political force. But it seems unlikely that there are actually 18 million active birders and anyone who attempts to measure the actual or potential impact of birders as a group should use realistic numbers. I guess depends on the definition of “birder”. I would say if you are looking at it as a marketing/businnes side of a consumer “birder” you are probably right. I would say the 18 million birders would be the part of the population that would actually stop and watch a bird if for example a cardinal flew by but might not actually consider themselves a birder. Where Are You Birding This Second Weekend of April 2016?